Interleukin-13 (IL-13) is a 17 kDa immunoregulatory cytokine that plays a key role in the pathogenesis of allergy, cancer, and tissue fibrosis . It is secreted by Th1, Th2, Th17, NK, and mast cells, visceral smooth muscle cells, eosinophils, and basophils . This pattern is similar to the expression of Interleukin-4 (IL-4) but also includes subsets of Th1 and Th17 cells that do not secrete IL-4 . IL-13 circulates as a monomer and has two internal disulfide bonds that contribute to its bundled four .-helix configuration . Mature human IL-13 shares approximately 58% amino acid sequence identity with mouse and rat IL-13. Despite the low homology, it exhibits cross-species activity between human, mouse, and rat . IL-13 suppresses the production of proinflammatory cytokines and other cytotoxic substances by macrophages, fibroblasts, and endothelial cells. On B cells, it promotes cellular activation, immunoglobulin class switching to IgE, and the upregulation of CD23/Fc. RII. Polymorphisms and upregulation of IL-13 are associated with atopy, asthma, airway hyperresponsiveness, and tissue fibrosis . The biological effects of IL-13 and IL-4 are closely related due in part to a shared receptor system. IL-13 binds with low affinity to the transmembrane IL-13 R.1 which then forms a signaling complex with the transmembrane IL-4 R. . This high affinity receptor complex also functions as the type 2 IL-4 receptor . Soluble forms of IL-4 R. are expressed which retain ligand binding properties and inhibit IL-4 bioactivity . IL-4 R. also associates with the common gamma chain (.c) to form the type 1 IL-4 receptor complex . 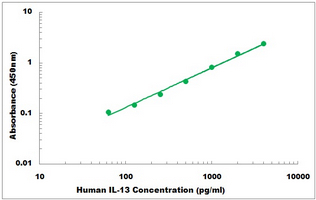 Additionally, IL-13 binds with high affinity to IL-13 R.2 which is expressed as cell surface and soluble forms . 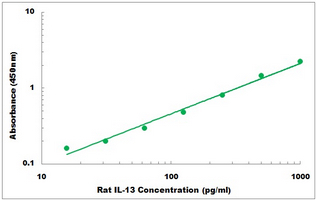 IL-13 R.2 functions as a decoy receptor by preventing IL-13 from signaling through the IL-13 R.1/IL-4 R. complex . It also inhibits responsiveness to IL-4 by blocking signaling through IL-4-occupied IL-13 R.1/IL-4 R. receptor complexes . IL-13 R.2 is upregulated during Th2-biased immune responses and limits inflammatory tissue damage . Aside from its decoy function, IL-13 R.2 can signal in response to IL-13 to directly promote tumor cell invasiveness and the development of tissue fibrosis . Townley, R.G. et al. (2011) Discov. Med. 12:513. Wynn, T.A. (2003) Annu. Rev. Immunol. 21:425. Joshi, B.H. et al. (2006) Vitam. Horm. 74:479. McKenzie, A.N. et al. (1993) Proc. Natl. Acad. Sci. USA 90:3735. Gallo, E. et al. (2012) Eur. J. Immunol. 42:2322. Moy, F.J. et al. (2001) J. Mol. Biol. 310:219. Eisenmesser, E.Z. et al. (2001) J. Mol. Biol. 310:231. Ruetten, H. and C. Thiemermann (1997) Shock 8:409. Lakkis, F.G. et al. (1997) Biochem. Biophys. Res. Commun. 235:529. Liu, Y. et al. (2012) Front. Immunol. 3:1. Aman, M.J. et al. (1996) J. Biol. Chem. 271:29265. Zurawski, S.M. et al. (1995) J. Biol. Chem. 270:13869. Andrews, A.L. et al. (2002) J. Biol. Chem. 277:46073. Kruse, S. et al. (1999) Int. Immunol. 11:1965. Jung, T. et al. (1999) Int. Arch. Allergy Immunol. 119:23. Kondo, M. et al. (1993) Science 262:1874. Russell, S.M. et al. (1993) Science 262:1880. Chen, W. et al. (2008) J. Allergy Clin. Immunol. 122:625. Chen, W. et al. (2009) J. Immunol. 183:7870. Daines, M.O. et al. (2007) J. Allergy Clin. Immunol. 119:375. Kasaian, M.T. et al. (2011) J. Immunol. 187:561. Andrews, A.-L. et al. (2006) J. Allergy Clin. Immunol. 118:858. Rahaman, S.O. et al. (2002) Cancer Res. 62:1103. Sivaprasad, U. et al. (2010) J. Immunol. 185:6802. Chiaramonte, M.G. et al. (2003) J. Exp. Med. 197:687. Fujisawa, T. et al. (2009) Cancer Res. 69:8678. Fujisawa, T. et al. (2011) Int. J. Cancer 131:344. Fichtner-Feigl, S. et al. (2006) Nat. Med. 12:99. 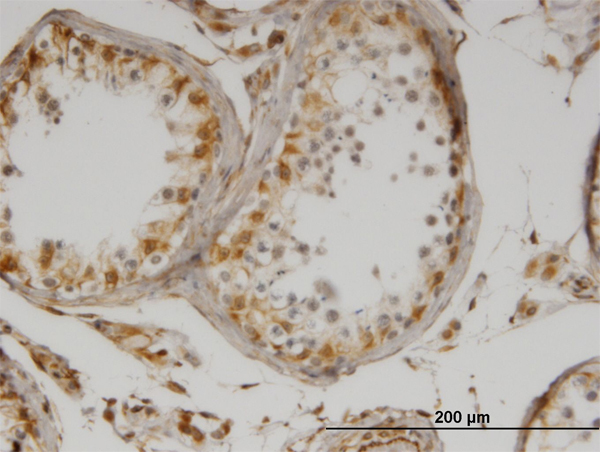 Formalin-Fixed, Paraffin-Embedded Rat Spleen stained with Interleukin-13 / IL13 Antibody Cat.-No AM20534AF-N at 10 µg/ml after heat-induced antigen retrieval. HEK293T cells were transfected with the pCMV6-ENTRY control (Left lane) or pCMV6-ENTRY IL13 (RC216947, Right lane) cDNA for 48 hrs and lysed. Equivalent amounts of cell lysates (5 ug per lane) were separated by SDS-PAGE and immunoblotted with anti-IL13. 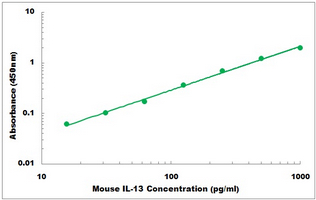 Western blot analysis of IL-13 expression using recombinant mouse IL-13. To detect hIL-13 by direct ELISA (using 100 ul/well antibody solution) a concentration of 0.25-1.0 ug/ml of this antibody is required. This biotinylated polyclonal antibody, in conjunction with compatible secondary reagents, allows the detection of at least 0.2-0.4 ng/well of recombinant hIL-13. To detect hIL-13 by sandwich ELISA (using 100 ul/well antibody solution) a concentration of 0.25-1.0 ug/ml of this antibody is required. 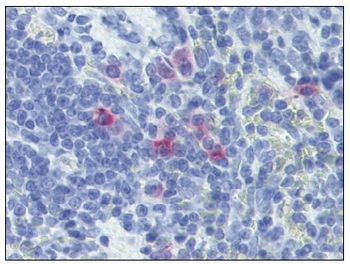 This biotinylated polyclonal antibody, in conjunction with Polyclonal Anti-Human IL-13 (TA328231) as a capture antibody, allows the detection of at least 0.2-0.4 ng/well of recombinant hIL-13. To detect hIL-13 by sandwich ELISA (using 100 ul/well antibody solution) a concentration of 0.5 - 2.0 ug/ml of this antibody is required. 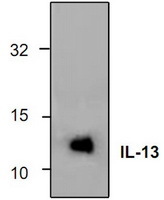 This antigen affinity purified antibody, in conjunction with Biotinylated Anti-Human IL-13 (TA328230) as a detection antibody, allows the detection of at least 0.2 - 0.4 ng/well of recombinant hIL-13. 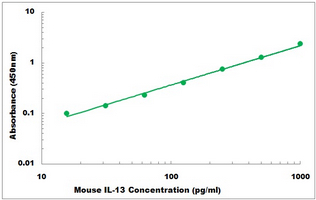 To detect mIL-13 by direct ELISA (using 100 ul/well antibody solution) a concentration of 0.25-1.0 ug/ml of this antibody is required. This biotinylated polyclonal antibody, in conjunction with compatible secondary reagents, allows the detection of at least 0.2-0.4 ng/well of recombinant mIL-13. To detect mIL-13 by sandwich ELISA (using 100 ul/well antibody solution) a concentration of 0.25-1.0 ug/ml of this antibody is required. 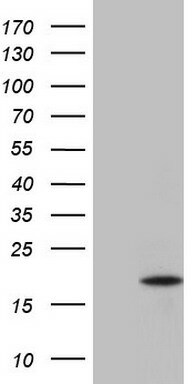 This biotinylated polyclonal antibody, in conjunction with Polyclonal Anti-Murine IL-13 (TA328499) as a capture antibody, allows the detection of at least 0.2-0.4 ng/well of recombinant mIL-13. To detect mIL-13 by sandwich ELISA (using 100 ul/well antibody solution) a concentration of 0.5 - 2.0 ug/ml of this antibody is required. 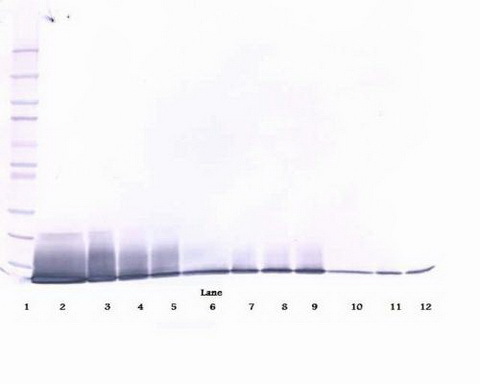 This antigen affinity purified antibody, in conjunction with Biotinylated Anti-Murine IL-13 (TA328498) as a detection antibody, allows the detection of at least 0.2 - 0.4 ng/well of recombinant mIL-13. 54 products - FILTER YOUR RESULTS!